Prominent & Leading Manufacturer from Ahmedabad, we offer imported multi activity play station and multi activity play station. Owing to our expertise in this domain, we are offering our clients a qualitative assortment of Imported Multi Activity Play Station. Our given play stations are manufactured by using quality assured material and existing technology. These play stations are creatively designed in appealing colors to provide kids a source of amusement. Our play stations are in huge demand amongst the children of various age groups and can be easily installed in fun parks, water parks and school. Our organization engaged in offering an extensive array of Multi Activity Play Station, which are made by using very superior and premium grade raw material. 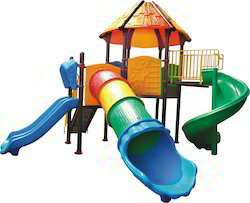 We offer these Play Stations in various specifications and dimensions. These Play Stations are widely available in at industry leading prices.